Find Bradford White Water Heaters that are guaranteed to get the job done. We offer high quality and long lasting electric water heaters that work in any home. Bradford White RE16U6-1NAL model is a 6-gallon, compact (utility type) 120V electric hot water heate.. 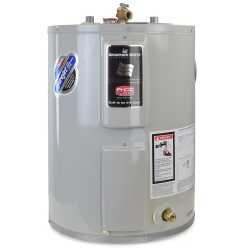 The RE120L6-1NCWW from Bradford White is a 19 Gal, Lowboy Electric Water Heater, 208/230V.Feat..